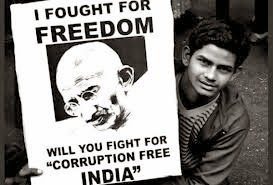 Posted by Unknown On 23:10 CORRUPTION Indians cowards paras bhanot POTERY ON CORRUPTION www.pparas.blogspot.com. But we don’t want to try. Has, it become our tradition? Or, do we lack the guts to face it? Corruption helps to set the culprits free. Has it become our way of life? To adjust to whatever it is? To rethink, reconstruct and reform our corrupt minds. Is it that no business runs without it? Is it that we don’t wanna put an end to it? Are we not prepared for it? Or we really don’t care? And put a full stop on it. And put a full stop on it .